NATALIE ZEMON DAVIS discusses Trickster Travels: A Sixteenth-Century Muslim Between Worlds. Natalie Zemon Davis was born to a middle-class Jewish family in Detroit, Michigan. She attended Smith College, where she participated in several political organizations and explored a passion for historical research. While still an undergraduate, she married Chandler Davis, then a graduate student in mathematics, with whom she had three children. 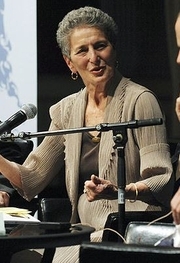 After graduation, she studied social and cultural history at Harvard University and then at the University of Michigan. After earning her PhD from Michigan in 1959, she taught at Brown University and the University of Toronto before going to Princeton University in 1978. She was one of the first historians to specialize in the lives of ordinary people rather than those of major figures. Her best-known book, The Return of Martin Guerre (1983), based on 16th-century court records, was adapted into an acclaimed French film for which she served as historical consultant. In 1987, she became the second woman to serve as president of the American Historical Association. Natalie Zemon Davis is currently considered a "single author." If one or more works are by a distinct, homonymous authors, go ahead and split the author. Natalie Zemon Davis is composed of 15 names. You can examine and separate out names.